America wants to get Masood Azhar Declared as Terrorist to Please India! On 02 April 2019, two important decisions regarding South Asia surfaced. This cannot be a mere coincidence that both decisions were in the favor of India supporting its strategies against neighboring countries. The first decision was about the approval of the State Department for the sale of MH-60R Helicopters to India. Although, US Congress has yet to approve the deal of 2.6 billion dollars after which 24 Multirole Maritime Helicopters capable of searching the underwater submarines and hunting them would be handed over to India. This is a big deal for the American weapon manufacturers while on the other hand this is being termed as the biggest source for Indian Naval supremacy in the area. Indian Navy claims that it needs at least 230 helicopters equipped with the latest technology. American Foreign Minister has claimed that the deal with India will improve the stability of India and establish peace in the region. Here the question arises that which is the country that could be a threat to Indian integrity and it needs naval power based upon American technology. Indian rulers claim Pak-China friendship as a threat to Indian integrity. The reality is that China claiming several parts of India have never threatened India. Pakistan also does not have any imperialist designs against any country of the region. Pakistan has been facing terrorism since 1947 and even now Indian jets are involved in bombings in Azad Kashmir. If we look at the Indian Foreign strategy and its relations with the neighboring countries there is not a single country that is safe from Indian aggression. However, there is one big reality that the USA considers China as a threat to her economy and interests. In 1962, India attacked China at the beck and call of USA. After the Chinese army’s befitting reply, India converted itself into a cache of weapons in the name of defense preparations against China. Being the biggest purchaser of weapons, international powers started ignoring the Indian atrocities committed against the minorities especially Indian state terrorism in India. This policy of ignorance of the international powers provided the chance for Hindu extremism in India which has now turned into a punishment for the minorities and those who do not believe in extremism even within India. Despite all such atrocities of India, American Policymakers think that in spite of fighting straight forward with China they can use India as a proxy against China. Whether they are Indian Rulers or Generals they know that they are inevitable for the USA and thus crossing all limits of state terrorism in Indian Held Kashmir and other states fighting for freedom from Hindu extremism. The second announcement of the American State Department was to use all of its resources to get banned outfit Jaish-e-Muhammad as a terrorist organization. 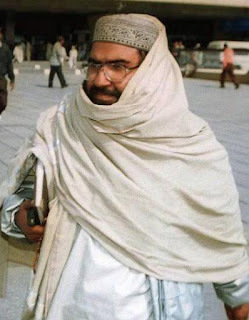 Americans were of the view that they will not leave any stoned unturned to get Masood Azhar declared as a terrorist from the UN Security Council and will take him to justice before the international community. China commented on the statements of Americans that The USA is trying to make the things complicated purposely. American steps would destroy peace in South Asia. Chinese represent said that China has a constructive and logical point of view on the issue of Masood Azhar and wants that this should be handled through the discussion and negotiations. The USA is well aware that India is using the name of Jaish-e-Muhammad for alleged Pulwama attack. USA is also well aware that neither had any evidence to support her previous allegations against Pakistan nor the Indian stance over Pulwama attack is based upon truth. Despite all this, if USA wants to get Masood Azhar declared as terrorist this is only the part of American strategy to withdraw her forces from Afghanistan but before the retreat USA wants to impose puppet rulers in Afghanistan in the name of elections. Astonishingly, including Samjhota Express terrorist attack and other terrorist activities have been alleged by India on Pakistan. Indian media exploited these attacks for their propaganda war; this media war made world believe Indian stance. 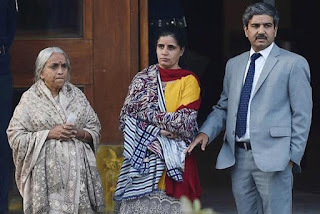 The Anti-Terrorist Squad (ATS) of India arrested the culprits of Samjhota Express and other terrorist activities in India; all the culprits were the on duty Indian army and intelligence officers and leaders of extremist Hindu organizations. They confessed their crimes before the court as well. Including America, all Western countries and their media practiced criminal silence. The worst criminal ignorance was practiced by Pakistani rulers of that because this was the time disclose the reality of Indian propaganda. However, treacherous leadership of Pakistan kept silent on such disclosures claiming it to be the internal affairs of India and kept on singing the chorus of AMAN KI ASHA. However, this does not mean that the USA exploits Indian propaganda wars against Pakistan for her damned interests. America has no right to support India in getting those who speak against India as terrorists in Pakistan just like the US does. America declared Afghan Taliban as terrorists and even UNO declared them as a terrorist but now the USA claims that negotiations with Afghan Taliban are the achievement of American policies. Hizb ul Islami that played a central role in the Afghan Jihad was declared as terrorist and bans were imposed upon its leader Hikmat Yar. Now he is present in Afghanistan and acceptable for the USA. 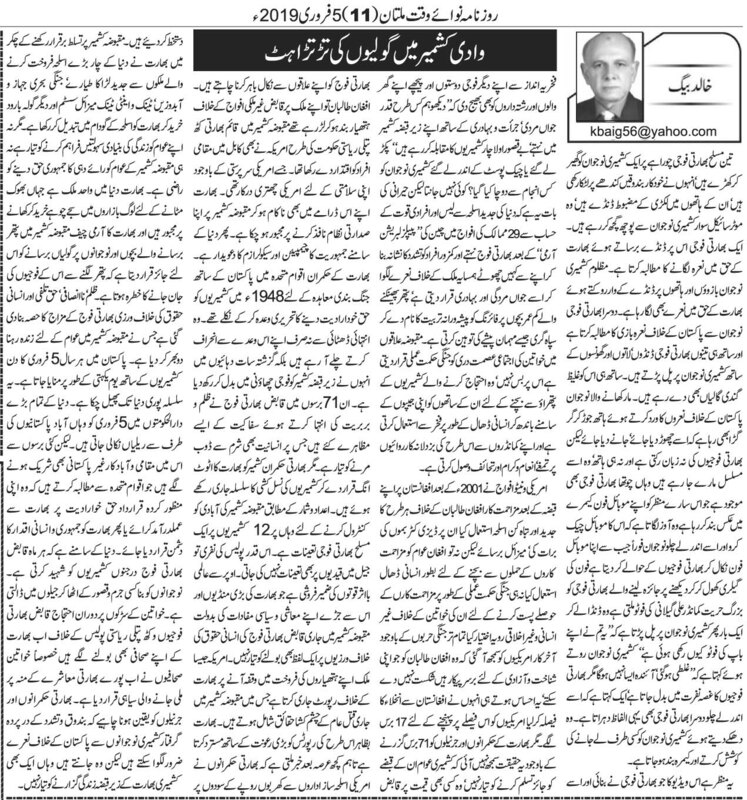 You may read the Urdu edition here. 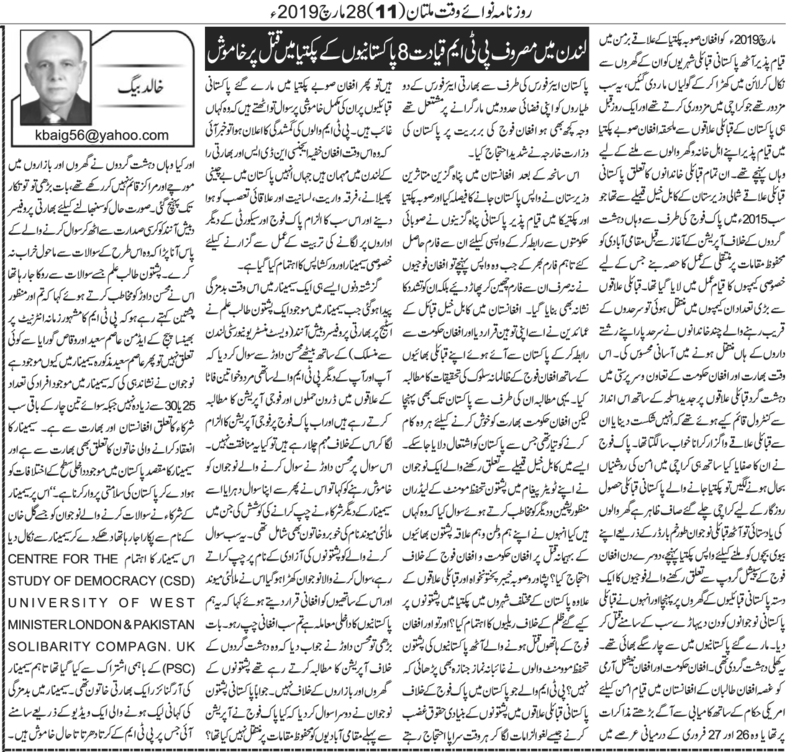 Urdu Copy of the article is available here. 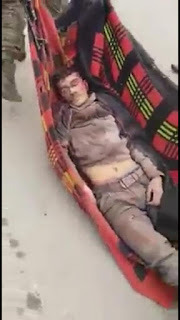 In March 2019 “Pakistanis living in Afghan Province Paktia mere taken out of their homes and shot dead. All of them were laborers who used to work in Karachi. They had returned to their families living in the Afghan province Paktia adjacent to the Pakistani tribal areas. They belonged to the Kabul Khel tribe of Northern Waziristan. They were shifted to safe places before the operation of Pakistani forces against terrorists in 2015. When a big number of tribals moved out of their homes, some families preferred to move across the border to their relatives in Afghanistan. 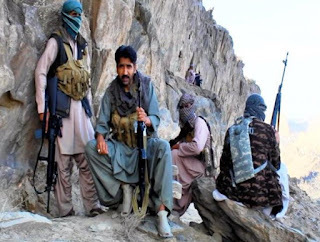 At that time with the support of Afghanistan and India, terrorists had established strongholds in the Pakistani tribal areas in such a way that taking the control of these areas from the terrorists seemed to be a dream. Not only Pakistani army defeated these terrorists armed with latest Indian weapons but also restored peace in the Karachi. So the male members shifted to Paktiya went to Karachi for earning the livelihood. When they missed their families they returned back to see their families in Paktiya. 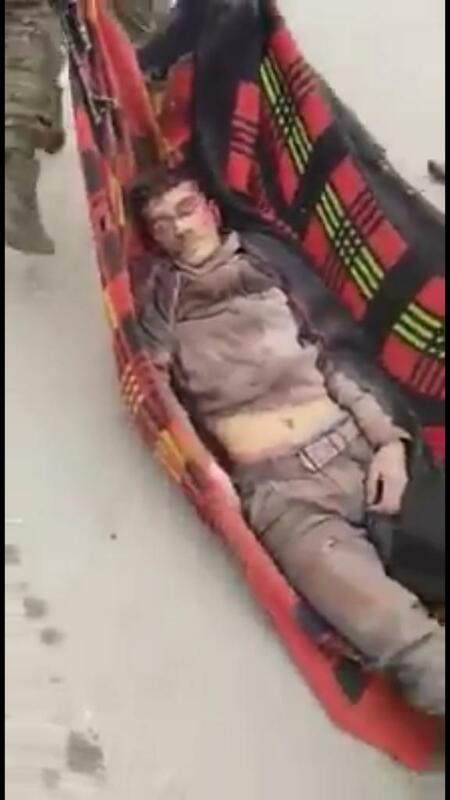 On the 2nd day of their arrival to Paktiya, a contingent of Special Forces group of Afghan army arrived at the homes of the Pakistanis living in Afghanistan and murdered them in front of everyone. Out of these 8 Pakistani 4 were real brothers. This was open state terrorism. Afghan govt. and National Army was angry over the advancement in the negotiations between the US officials and the Taliban or they were angry over the shooting down of Indian air crafts in Pakistani aerial territory. Whatever the reason was, Pakistani Foreign Ministry protested over the state terrorism of the Afghan National Army. After this tragedy, Pakistanis decided to return back to Pakistan. They contacted the Afghan provincial govt. of Paktiya and Paktika and got the forms for paperwork. When they went to return the forms, the Afghan army snatched the forms from them tore them up and tortured them. This was taken as an insult by the Kabul Khel tribes in Afghanistan. They contacted the Afghan govt. and demanded that torture on their Pakistani guests should be investigated. Similar demands from their side reached Pakistan as well. However, the Afghan govt. is ready to do anything to please India that may force Pakistan to take aggressive steps. In the meanwhile, a youngster from Kabulkhel tribes in his tweet addressed to PTM leadership said that have they forgotten their Pashtun brethren belonging to the same area? Have they protested against the murder of Pashtuns by Afghan govt? and Army? Did they take out any rallies against the murder of 8 Pashtuns in different cities of Pakistan? 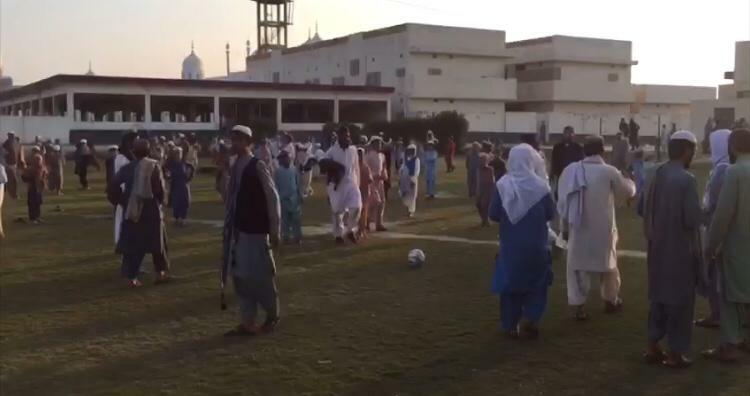 Have they organized funeral prayers for these murdered Pashtuns? 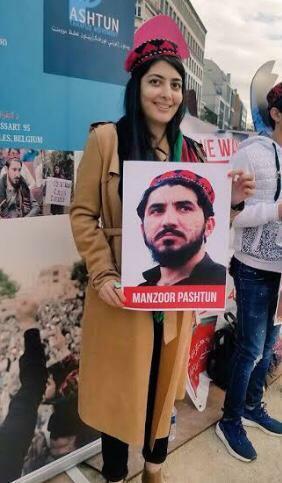 PTM who is always seen busy in protests against Pakistan army alleging that Pakistan army is involved in usurping the basic rights of Pashtuns than why are they silent over the Pashtuns killed in Afghanistan? When the silence and absence of the PTM leadership were noticed it was reported that they are guests of NDS and Indian RAW in London. Here they were especially being imparted with the training to spread restlessness, sectarianism, linguistic disputes and blame Pakistan for all this. Few days ago in a similar seminar, when a participant asked Mohsin Dawar sitting beside the Indian Professor Dabesh Anand linked with Westminister University of London, that you and your fellow members of PTM has been demanding drone attacks and military operation and now they are involved in the propaganda against Pakistan army for the attack, is not this open hypocrisy. 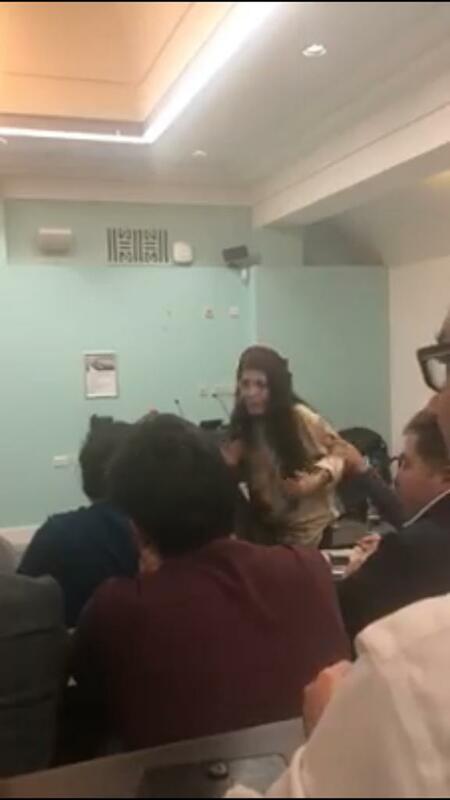 Mohsin Dawar asked the questioning participant to stay silent. When he repeated his question other participants including a beautiful lady Malalai Mewand tried to make him silent. All these people tried to silence him in the name of freedom of speech. 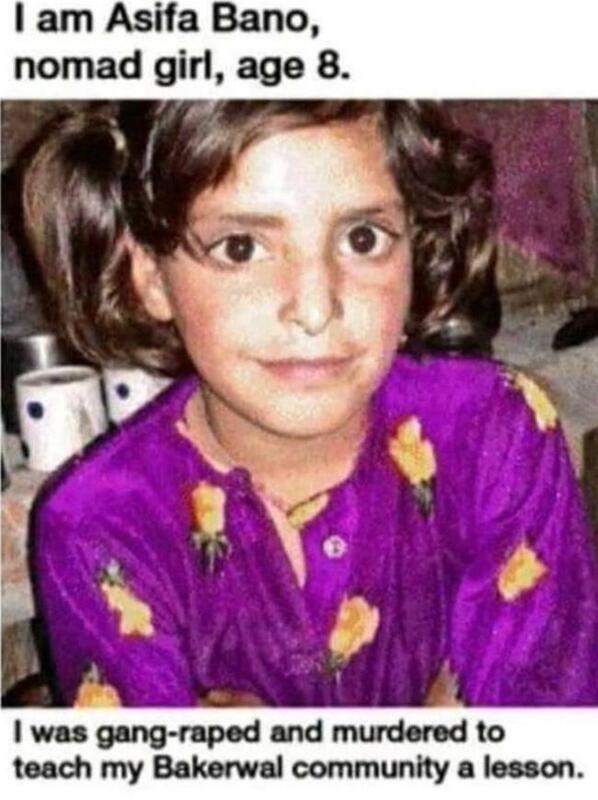 At this the youngster stood up and declared all of them including Malalai as Afghani, demanding that they should stay silent over the internal affairs Pakistan. When the youngster did not stop, Mohsin Dawar said that he demanded military operation against the terrorists not against the businesses and markets of Pakhtoons. As a reply to the Mohsin Dawar’s statement, he asked that has not Pakistan army shifted locals to the safe places before the start of the operation? Had not the terrorists established the hideouts in the houses and bazaars? This turned into a quarrel. Indian Professor stood up to control the situation and went to the Pakistani Pashtoon youngster that he should not create a problem by asking such questions. Pakistani Pashtoon who was being stopped from asking questions said that Mohsin Dawar and Manzoor Pashteen used to say that they have no link with the administrators of notorious Bhensa Page over facebook Asim Saeed and Waqas GOraya. Than why Asim Saeed is present in the seminar? The youngster pointed out that out of 25-30 participants of the seminar only 3-4 are Pakistani while the rest of them belong to India and Afghanistan. 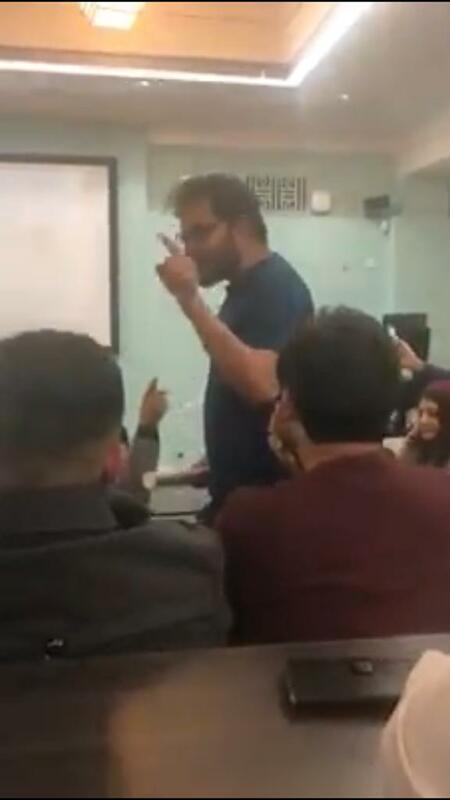 The woman who organized the seminar belongs to India and the sole purpose of the seminar is to fuel internal clashes within Pakistan to sabotage the integrity of Pakistan. On this, the participants of the seminar shoed out the youngster named as Gul Khan. 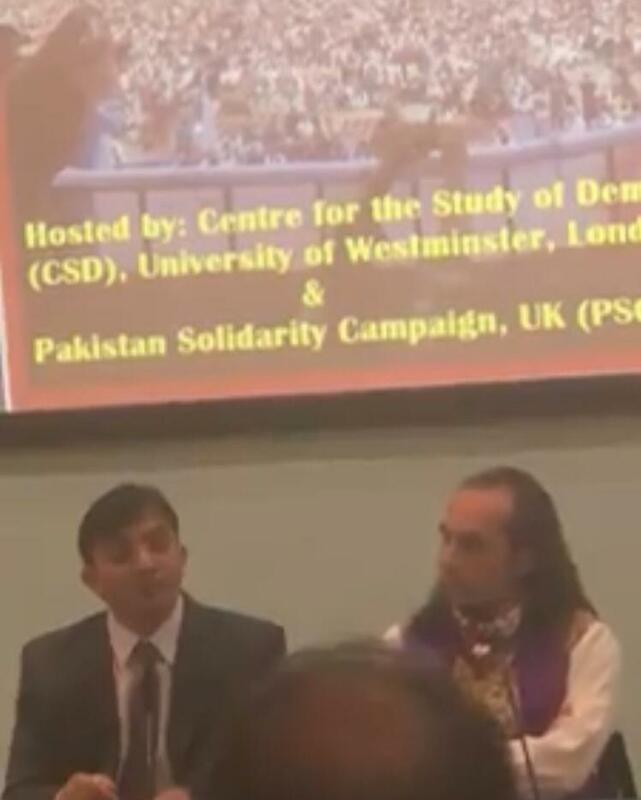 The seminar was organized by the Center for the Study of Democracy (CSD) and University of West Minister London and Pakistan Solidarity Campaign UK. However, an Indian woman organized the seminar. The story of the seminar was leaked out through a video on which PTM has not reacted yet. The day of 13 March 2019, got importance when few liberal intellectuals started forecasting in the talk-shows that Pakistan's trusted friend China will not support Pakistan by using veto power over the Masood Azhar for declaring him as a terrorist. They do not have any effective argument for support of their stance. Despite this, they (liberal Pakistan intellectuals) said that in the way the present after coming into power expressed concerns over CPEC has hurt the Chinese trust. Moreover, China has concerns over the inclusion of KSA in the CPEC. Few liberals tried to make public hopeless by saying that when govt. itself is involved in capturing the center of Jaish-e-Muhammad on 21 February 2019 in Punjab and FATF while acting upon the National Action Plan approved in 2014, in order to nullify the effect of Indian lobbying. So in such a situation why would China veto the resolution against Masood Azhar presented by three powers France, Britain, and USA. Such discussions created unrest in the whole nation. Pakistanis were not concerned over the threats of Indian Prime Minister or Indian army's war preparations nor they were afraid that after the destruction of two fighter jets Indian Air Force would launch more attacks. 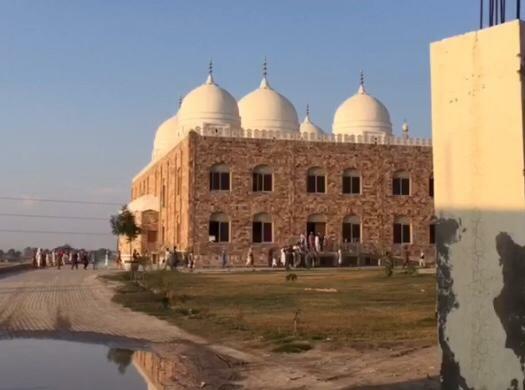 They were concerned that if China in spite of vetoing the resolution against Masood Azhar favored it, than it would be necessary for Security Council to declare Masood Azhar as an international terrorist, than the inclusion of Pakistan in Black List was inevitable. In this regard, PPPP Chairman disclosed in his address to SIndh Assembly that three Ministers of the ruling party were in contact with important personalities of banned outfits and PTI came into power through their support. 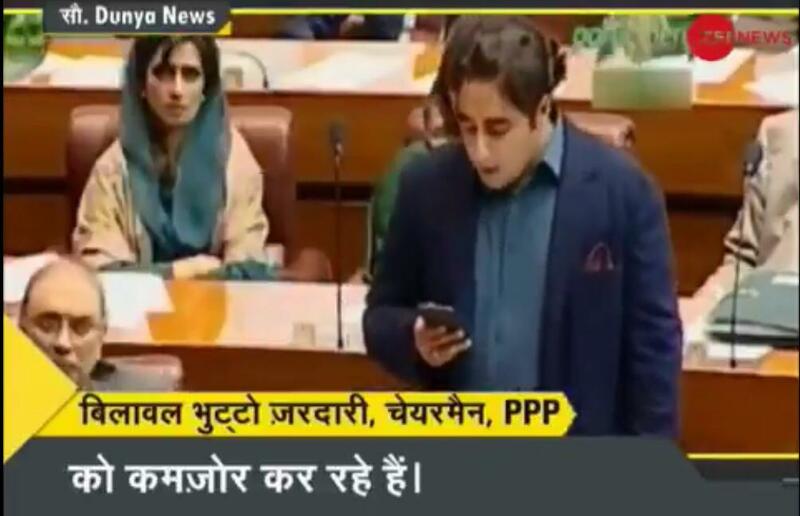 Bilawal's whole speech was in Urdu however, the allegations over PTI were in English. Before this, during his address to Parliament, he said that PTI is reluctant to take any action against banned outfits. This statemetn was given much coverage by the Indian media. Few anchor persons questioned the timing of Bilawal's speeches while others said such sentences proving that they are still haunted by the aggressive speeches of Zardari. The meaning of their statements was that we have been supervsing the banned outfits. The words might be different but the meaning of the statements was similar to Indian blames that she has been using to seclude Pakistan and for ecomonical bans on Pakistan. In fact, Indian opposition parties, serious and neutral jounralists, retired Indian Generals and Air Force officers have raised suspicions over the Pulwama drama and confessional video of Adil Ahmed Dar. They claimed this drama was staged to win elections by Modi. The video of Adil Ahmed Dar claiming the responsibility of Pulwama suicide attack as an activist of Jaish-e-Muhammad was rendered as doubtful as he war arrested on 09 September 2017 by Indian Army. An Indian journalist raised the question that on what terms and conditins was he released by Indian army? The second question raised by the Indian journalist was that in the news of 10 September 2017, Dar was claimed as the activist of Lashkar-e-Taiba while two others were declared as the activists of Zarb-ul-Mujahideen, so after the arrest, Dar decided to join Jaish-e-Muhammad? After these objections, whole India rejected the Pulwama drama. However, Indian Prime Minister Modi, Indian Army and Hindu extremists decided to take the confessional video of Adil Ahmed Dar to the Security Council for declaring Masood Azhar as an international terrorist and their so called aerial strike for their election campaign. Indian govt. exploited Bilawal's statement for her nefarious designs but China rejected the resolution presented by the USA, France and Britain on the technical basis. After the 27 February the three international powers based their resoltuion on the Dar's confessional statement, for this reason, the three allies of India along with India requested China not to veto this resolution on which China replied that she will consider it. This silence of China was considered as the willingness to accept Indian request by Anti-Pakistan army elements in Pakistan and started spreading hopelessness that this time China will not reject the resolution. They all ignored that this resolution was against Pakistan. On 13 March 2019, at about 11 pm CNN and all other international media reprted that China has rejected the resolution against Masood Azhar saying that just like previous resolution it has no solid evidence. Merely on the basis of allegations no country can be declared as the terrorist. 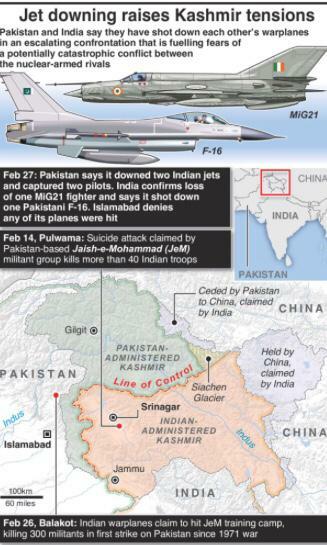 The China's stance was more painful for India than shooting down her latest jet fighters in Azad Kashmir. At once Indian media started propaganda against China and started claiming China to be the friend of terrorists. 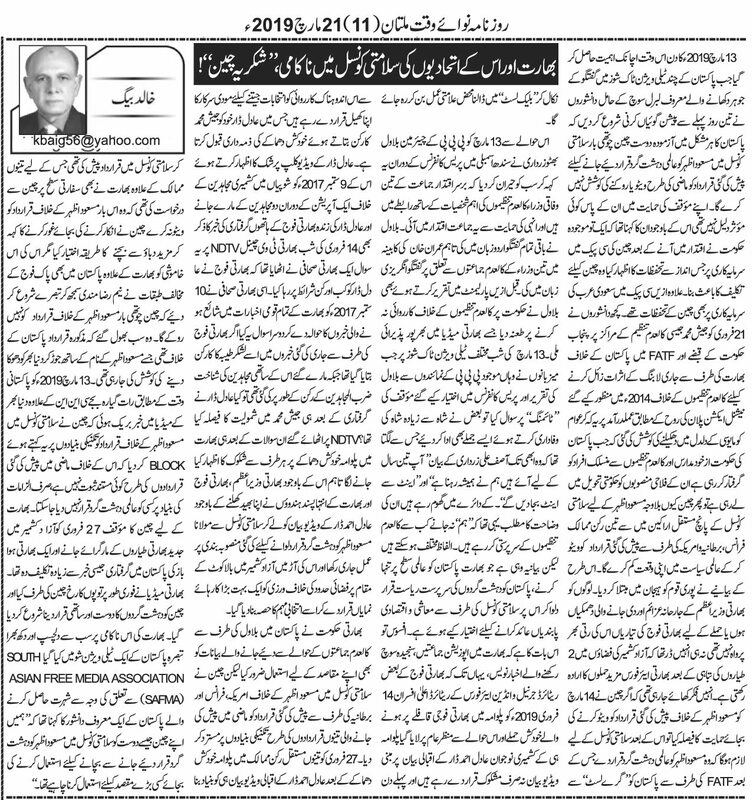 The most interested and sorrowful analyses was from a notorious journalist of Pakistan member of SAFMA in which he said that we should have used China for somehting bigger rather then saving Masood Azhar from being declared as terrorist. What has suddenly happened that Pak-India tense relations escalated from aerial skirmishes to nuclear war? The answer is simple, since Pakistan's independence in 1947, India is busy in conspiracies against the independence of Pakistan. Few years before the independence of Pakistan that massacre of Muslims of Jammu and Kashmir and just after ten weeks of independence Indian attack over Kashmir was the serious attack against the independence of Pakistan which was thwarted by the Pakistan army with the help of tribes of Waziristan and one third of the Kashmir was freed from Hindu army. 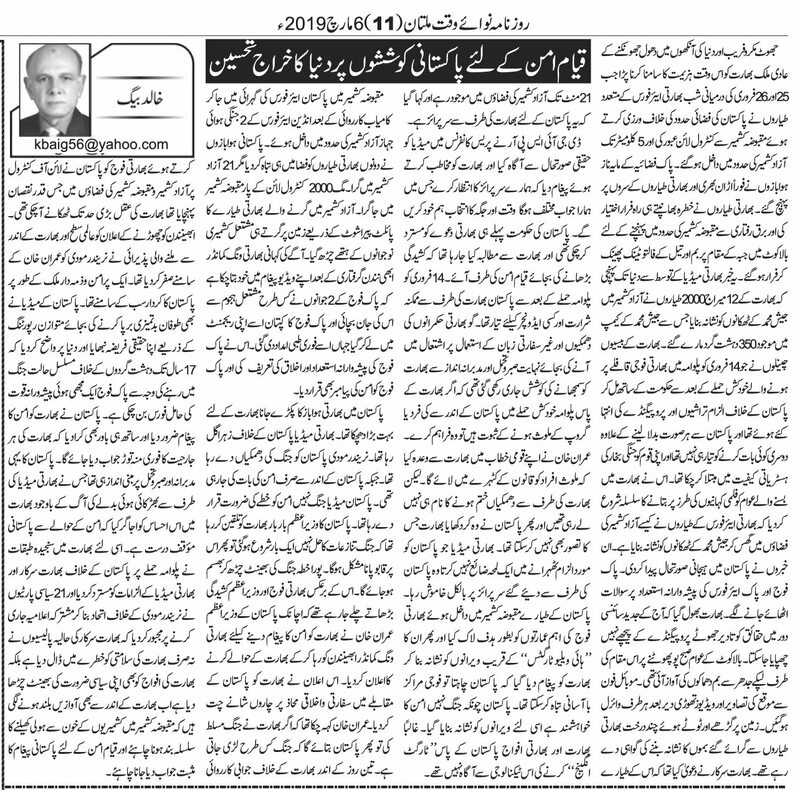 For India and Britain, the success of Pakistan was not astonishing but shocking as well. Because against the formula of the division of assets Pakistan was deprived of the heavy weapons. Despite all this Pakistan army not only challenged the Hindu army but also forced them to withdraw. This not only shattered the Hindu dreams against newly born Pakistan but also the Indian plans to control South Asia. The war that continued for 1 year, India realized that soon Kashmir will slip out of her hands, so she begged to UNO. With the promises of giving Kashmiris the right to chose their future, India came back with the letter of ceasefire from Christian UNO. Since then Indian politicians, Military and Civil establishment, journalists and intellectuals have been targeting Pakistan army. Whether this was the war of 1965 or international conspiracy of 1971, neither Indian enmity against Pakistan end nor India fulfilled her promise of giving right to Kashmiris to decide their future nor acted upon the resolutions of the UNO. On the one hand Hindu rulers attempted to keep Muslims of Kashmir under control through torture, violence, massacre and gang rapes while on the other hand the propaganda war against Pakistan army continued considering it as the big blow against Pakistan's integrity. The fabricated stories of Pakistan army's atrocities against Bangladeshi's have been disclosed by Indian researchers and retired officers. In the book Dead Reckoning, Sharmila Bose has rejected all the fabricated stories against Pakistan army in her 11 years long research. 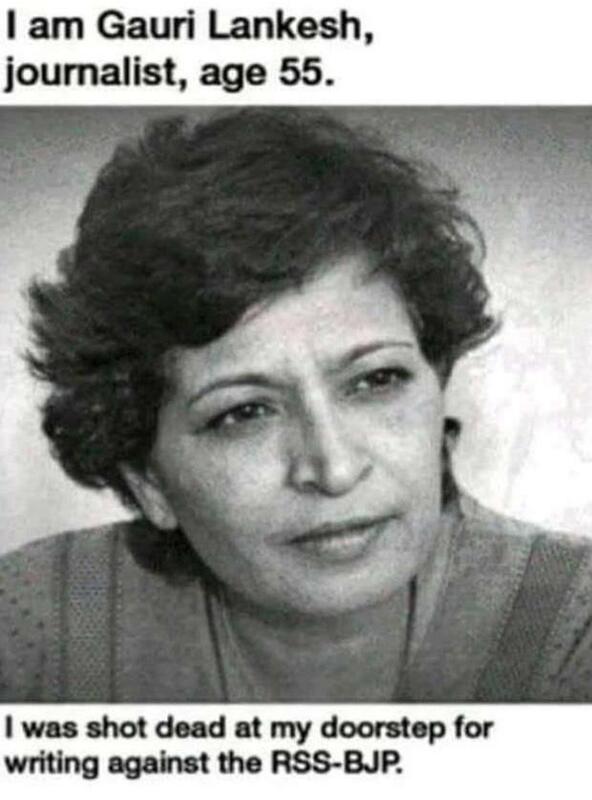 According to her whatever has been told about Dhaka is just lie and an organized propaganda to cover the Indian conspiracies against Pakistan. This propaganda has been utilized as an effective weapon against Pakistan and Pakistan army. 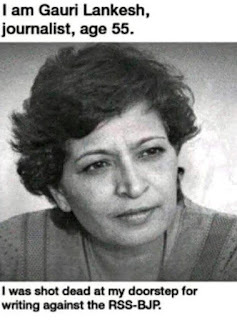 Sharmila Bose is the grand daughter of Sarat Chandar Bose, one of the two important Hindu leaders who started the campaign for the freedom of India. 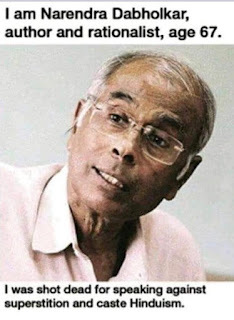 Even the Hindu Prime Minister has proudly confessed at Dhaka in 2015 that he remained a part of the Mukti Bahni conspiracy hatched to disintegrate Pakistan. Despite this, we have no shortage of such traitors who still preach the hatred against Pakistan army for atrocities in East Pakistan. This propaganda is sometimes observed as the only reason of economical instability of Pakistan and sometimes Defense budget is criticised. No one talks about the big plans of PIA, Steel Mill and other such projects going in the loss for which Pakistani nation has to pay the interest on the so called foreign investment in the form of loans. How corruption and looting of national assets became the part of the society and state laws has been rendered useless, no one talks about it. Modi's special advisor Ajeet Kumar Doval presents the war doctrine of Offensive Defence. This includes the weakening of the Pakistani economy as a war strategy. Obviously, the Army can only defend the nation when the economy is strong. The Pakistani army is facing two types of the enemy, open traditional enemy and other the unseen enemy present within the nation involved in remote control and suicide bomb blasts. 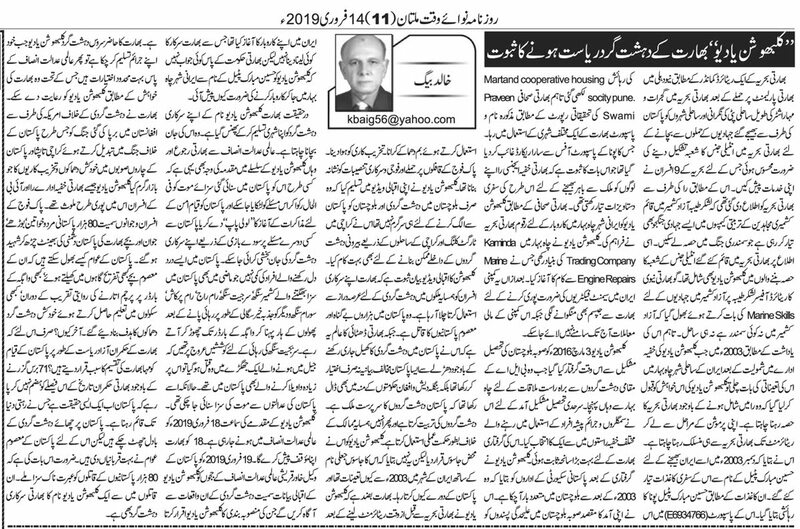 These unseen enemies try to raise concerns in the public about the integrity of Pakistan, raise suspcion and hatred against the army within the public. This is known as the hybrid or 5th generation war. Pakistan is not only stead fast on both battle fields since 2002 but also reamined victorious in the war on waged on Pak Afghan border as well. Enemies of Pakistan along with traditional enemy Indian worried over the victories of Pakistan army first staged the Pulwama attack in order to provide a reason for the aggression over LoC and international borders. Indian fighter jets staged the drama of killing 350 terrorists of Jaish-e-Muhammad in the Azad Kashmir. Indian fighter jets dropped their bombs few kms within the Paksitani area and flew away to avoid any retaliation by Pakistan Air Force. As a reaction, Pakistani fighter jets enterned into the Indian controlled Kashmir and fired missiles near Indian Military installations as a warning to Indians that their installations may be bombarded as well. 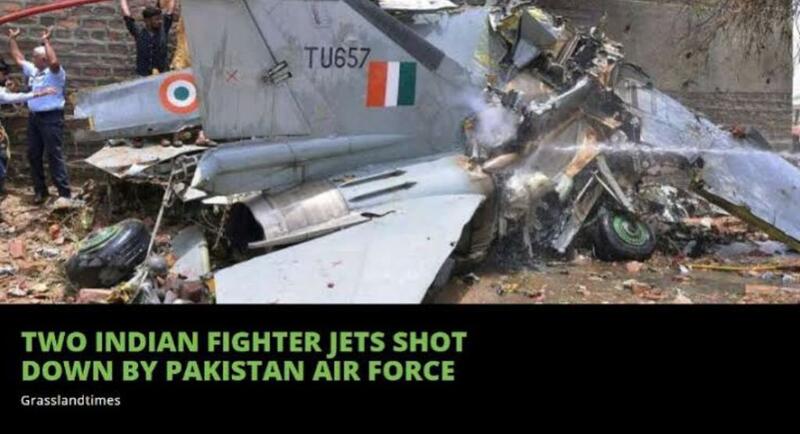 Indian fighter jets followed Pakistani fighter jets and were shot down. 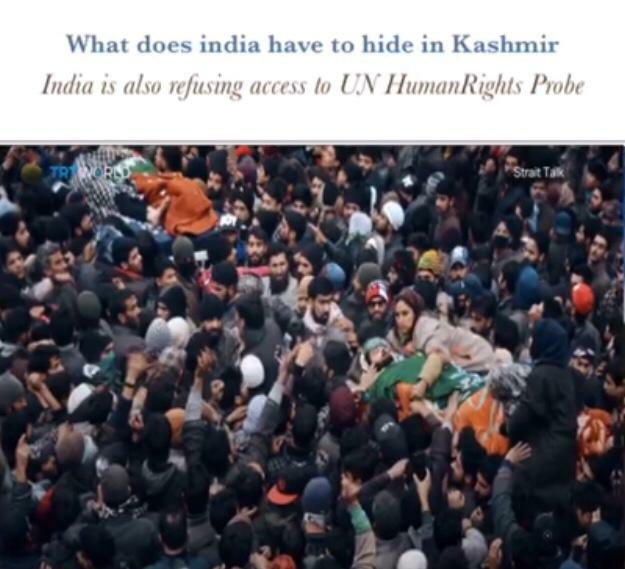 What else could be the shame for Indians on the international level that on the one hand Indian public, opposition and international community has rejected the Pulwama attack and bombarding of Jaish-e-Muhammad in Azad Kashmir. Moreover, alongwith the destruction of fighter jets, one MI helicopter of Indian Army Aviation was destroyed as well. 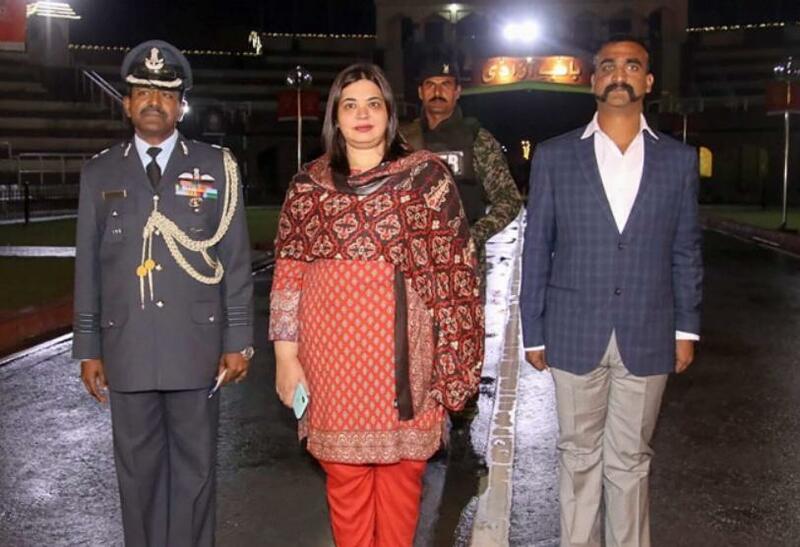 One Indian pilot arrested by Pakistan was presented over the media. In such a situation India decided to launch missile attacks with the help of Israel over Bahawalpur, Karachi from Rajasthan border. After intervention from Pakistan's friends and international powers, the war between both countries was thwarted as they feared that Pakistan will give an unexpected reply with nuclear missiles. Although the war has been postponed but India busy in conspiracies against Pakistan since the last 71 years will not stop her conspiracies. In such a situation Paksitan will have to remain more vigilant and invent new modern weapons for which present Defense Budget of Pakistan is insufficient. Pakistan army who has been sacrificing its soldiers and officers is ready for more martyrdoms. However, wars cannot be won through bravery only. Even Allah has ordered us to keep our horses ready. So in this situation increase in the defense budget is the need of the hour which is already suffering great pressure due to the decreased value of rupee against dollar. India expert in fabricating stories and telling lies had to lick the dust when Indian Air Force crossed Line of Control (LoC) and entered up to 5 Kms within Azad Kashmir. Within no time Pakistani fighter Pilots were on the heads of the Indian Air Force. 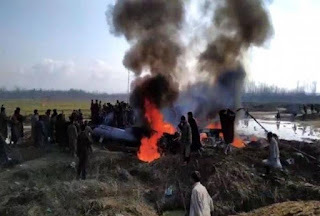 Indian Pilots choose to run away and in order to reach within the air space of Indian Held Kashmir (IHK), they dropped their extra fuel and bombs (payload) to increase the speed of the fighter jets. This was reported by the Indian media that 12 Mirage 2000 bombers of Indian Air Force targeted hideouts of Jaish-e-Muhammad in the Azad Kashmir killing at least 350 terrorists. Uncountable channels of Indian media had been fueling war mania in the public with the help of Indian govt. for taking revenge of Pulwama attack from Pakistan. Indian extremists had been suffering from war mania and became hysterical. They started reporting the fairy tales of Indian Air Force's attack on Azad Kashmir exactly on the basis of the Bollywood movies. Such news created tensions in Pakistan as well. Questions were raised over the professional capabilities of the Pakistan army and Air Force. India forgot that in today's modern era of scientific development it is impossible to hide truth through propaganda for long. As soon as the sun rose, the public of Balakot hasted towards the area where the sounds of bomb blasts were heard. Within no time the pictures of the alleged targeted area got viral on the social media. The craters created on the ground and the fallen trees were the results of payload dropped by Indian airplanes. Indian govt. has claimed that its warplanes remained in Pakistan for 21 minutes in the air of Azad Kashmir. This was declared as a surprise for Pakistan. Director General of ISPR Pakistan cleared the situation to the media through Press Conference and told India to be ready for Pakistani Surprise in which we will choose the target and time. Pakistani govt. had already rejected Indian claims and demanded that India should avoid escalating the tensions and work for peace in the area. After Pulwama Attack, Pakistan was ready for any mischievous act and misadventure of India. Although Pakistan has been reacting patiently and asking India to provide evidence for the involvement of any group or Individual in Pulwama attack. Prime Minister Imran Khan promised that everyone who is proved to be involved in these attacks would be brought before the law. However, India has been continuously threatening Pakistan. Then Pakistan did which was not even imagined India in her wildest nightmares. Indian media which does not spare a second to defame Pakistan remained silent over the surprise from Pakistan. Pakistan Air Force locked important buildings of Indian in IHK and than shot missiles few feet away in the open area giving a clear message to India that Pakistan might have destroyed Indian Military installations and High-Value Targets easily. As Pakistan is not in favor of the war that is why missiles were fired in the open areas. Perhaps Indians and Indian Armed Forces were not aware of Pakistan's technology to engage targets in such a way. As a reaction to Pakistan's attack, 2 Indian Air Force fighter jets entered into the air space of Azad Kashmir. 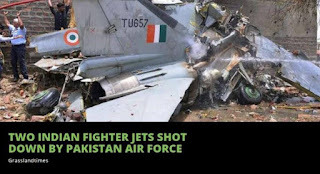 Pakistan Air Force destroyed both Indian fighter jets within the air. One Mig-21 fell within the area of Azad Kashmir while others fell in the area of IHK. 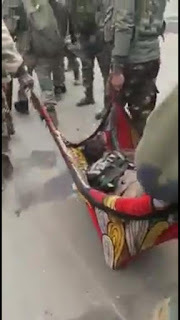 The Indian pilot who succeeded in safely ejecting the falling Mig-21 fell in the hands of the angry Kashmiri mob. 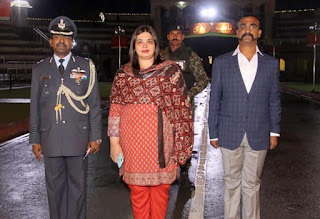 The rest of the story has been told by Indian Wing Commander Abhi Nandan in his video message that how 2 soldiers saved him from angry mob and Captain of Pakistan army took him to the regiment where he was given first aid. He praised the professional capability of the Pakistan army, courtesy and declared Pakistan army as the messenger of peace. The arrest of an Indian pilot in Pakistan was the biggest blow for India. Indian media was busy in propaganda against Pakistan. Narendra Modi has been threatening Pakistan while Pakistan was insisting for peace. Pakistani Media was busy in proving that peace is the need of the region, not war. Pakistani Prime Minister has been making it clear to India that war is not the solution to the problems and if once started, war will be unstoppable. The whole region would be destroyed in the war between two nuclear powers. In contrast to this Indian Army and Prime Minister were busy in escalating the situation. Another surprise was the declaration to release Indian Wing Commander Abhi Nandan. This was a serious blow to India on a diplomatic battlefield as well. Imran Khan made this clear that if India started a war that Pakistan will teach her that how wars are fought. In the way Pakistan has damaged Indian Army over LoC and Aerospace of IHK, India has realized much more. The decision to release Abhi Nandan increased the worth of Imran Khan even within India as well while the ranking of Modi fell to zero. 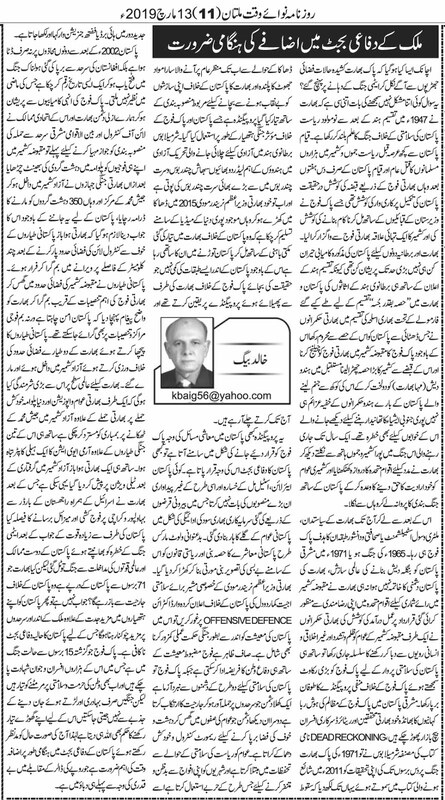 The role of Pakistan as a peaceful country was in front of everyone. Pakistani media also showed the tradition of balanced reporting in contrast to Indian media's propaganda. This proved that 17 years long war against terrorism has converted the Pakistan Army into a professional army. 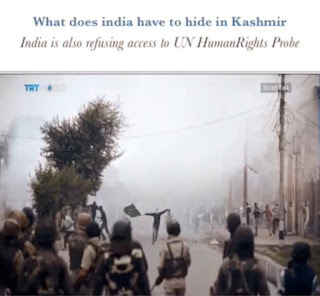 After the suicide attack over Indian forces in Pulwama, Indian Occupied Kashmir (IOK), the baseless allegations of the India and the Indian media has been questioned and objected. 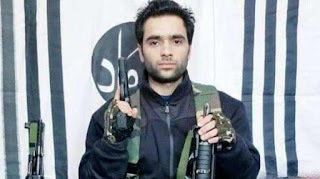 However, no one has discussed that if being forced by Indian massacre in last 71 years, a Kashmiri youngster has chosen to become a suicide bomber in order to take revenge of thousands of innocent Kashmiris martyred by Hindu Army; there would be someone else who would be thinking to follow the footprints of Adil Ahmad Dar. India herself has admitted that Adil Ahmad Dar used Indian manufactured dynamite for suicide bomb. 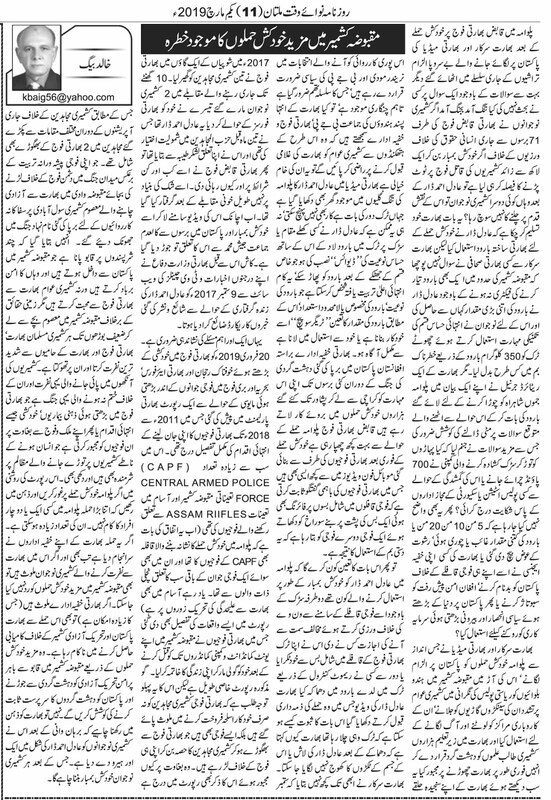 No one asked that how Adil AHmad manufactured the dynamite while there is not a single dynamite manufacturing factory how did he get 350 Kgs of dynamite converting a mini-truck into a dangerous. A retired Indian army officer attempted to bury the issue by claiming that said dynamite was brought widen the Pulwama-Jammu link road. This raised further questions that why did not the company lodge the complaint regarding theft of 700 pounds of dynamite? Moreover, this has not been clarified that how much of dynamite was actually stolen or sold out or Indian RAW used it for attack over Indian Army’s convoy to defame Pakistan, sabotage Afghan Peace process or increasing importance of Pakistan and increasing investment in Pakistan. In the way Indian govt. 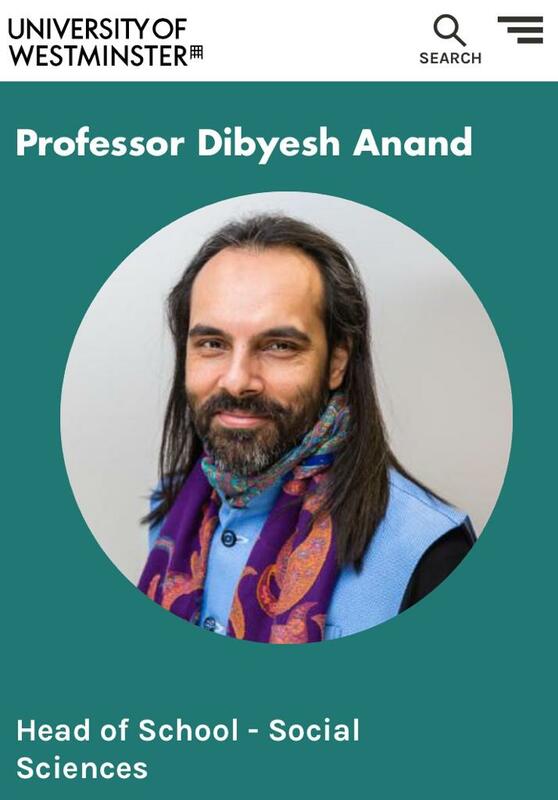 And media exploited Pulwama bomb blast to blame Pakistan, incite Hindu Extremists to attack Muslim properties in IOK under the supervision of State Police, burning vehicles, markets and forcing Kashmiri Students studying in Indian Universities to leave India, labelling them as Terrorists. The serious groups in the India has claimed this as the political stunt of Modi and BJP for the upcoming elections. 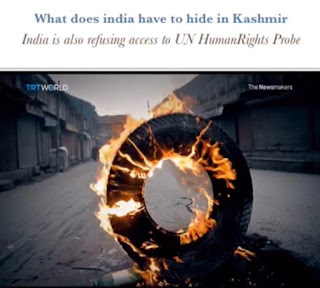 However, this has been temporarily stopped but there are still threats.Does Indian extremist Hindu leaders and army thinks that in this way they will be able to pressurize Kashmiris to give up the right of freedom. They are daydreaming. 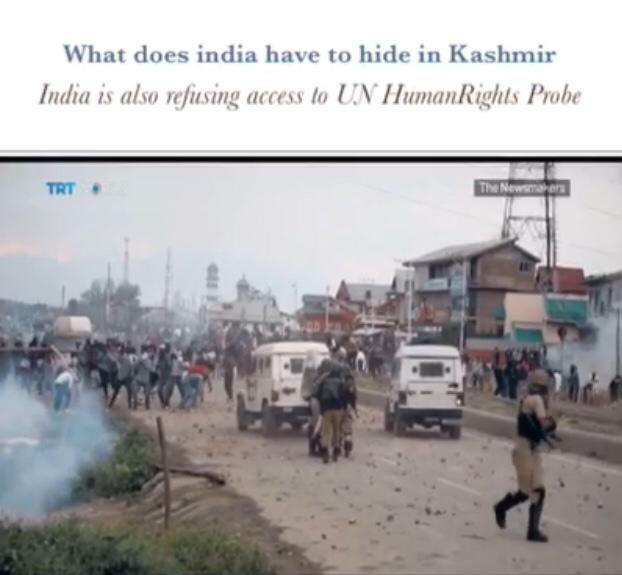 Indian media showed the house of Adil Ahmad Dar in the narrow streets of Pulwama where not even a car can reach leaving aside the truck. It is also not possible that he has implanted the sensitive device in the truck in the open area; this can be done someone having the sound technical knowledge who has knowledge of the dynamite’s quality, designing the trigger switch etc. Indian intelligence agencies has used this expertise from Karachi to Peshawar in terrorism in Pakistan. Indian forces are hiding too much with respect to Pulwama attack. 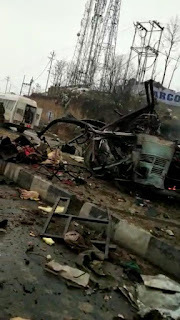 The mobile videos filmed by the Indian soldiers after the bomb blast which has voices of Indian soldiers captured as well which shows that Indian soldiers buses were fired upon as well; a soldier is showing to another the hole in the back of the bus that this was created due to the use of the hand grenade. 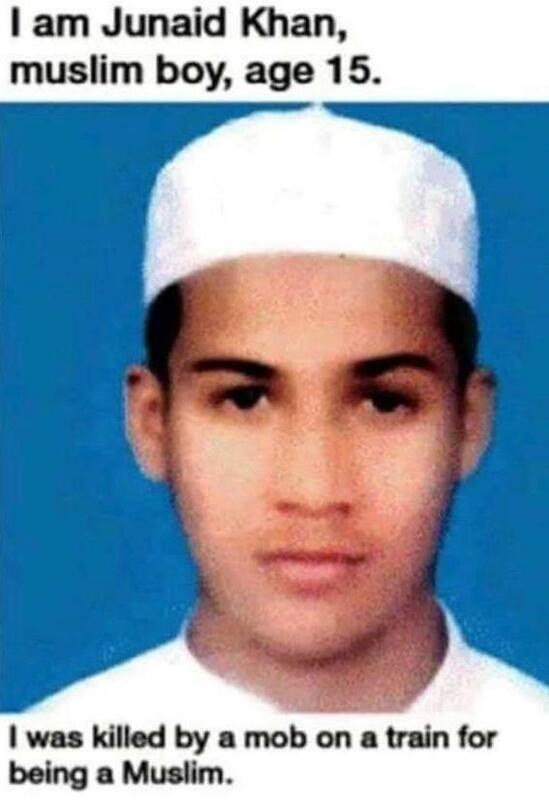 Who will answer that who used Adil Ahmad Dar in the suicide bomb blast? Who allowed him to drive over the wrong side despite the movement of the convoy on one way road? Whether he hit his truck himself with the Indian soldiers bus or someone else blasted the bomb via remote control? How the video of Dar in which he is claiming that he blasted the truck can be an evidence that he was driving the truck? 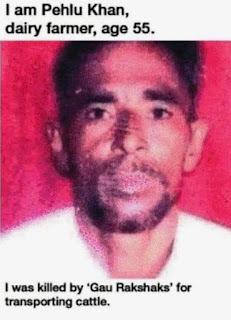 Why did India say that after blast the dead body or his remains could not be found? 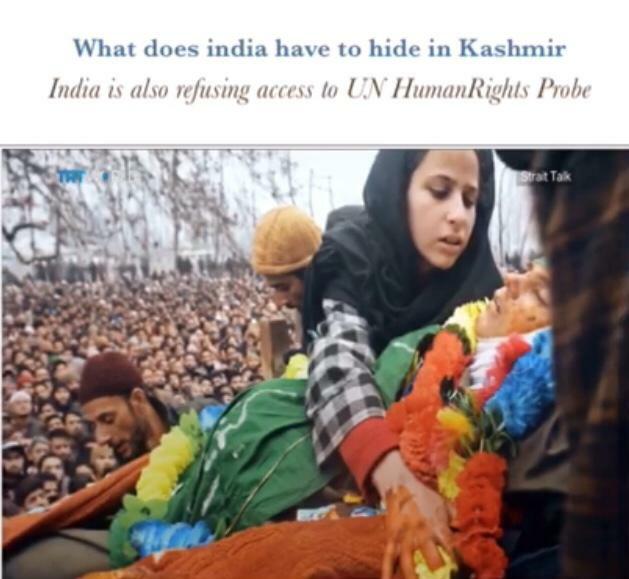 Why did not India disclose that during an encounter in the September at Shopian, 2 out of 3 Kashmiri Mujahideen were martyred while one was arrested alive and he was Adil Dar. he has joined Hizbul Mujahideen three months ago. 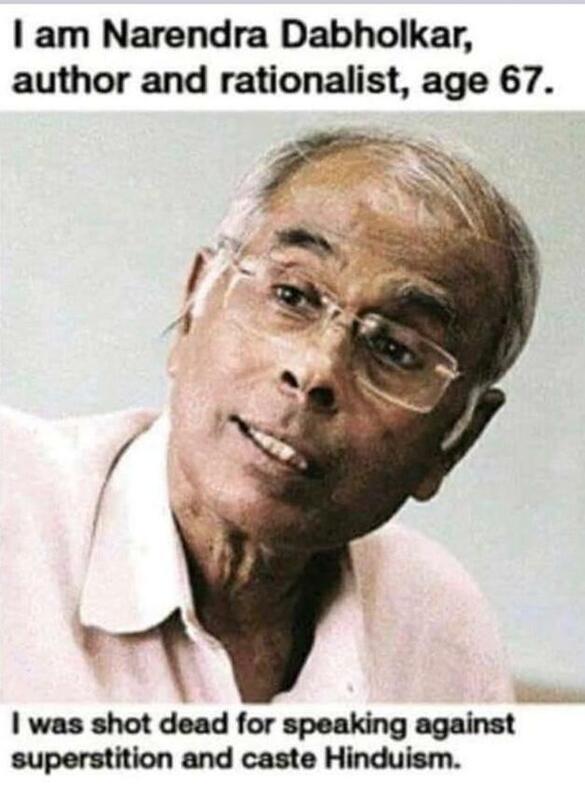 Why did India release him and on what conditions. He was not arrested on the basis of suspicion but after a long bloody encounter. Now suddenly his video has been disclosed and he has been linked to banned outfit in Pakistan Jaish-e-Muhammad. Indian Defense Ministry should have deleted record of his being arrested alive on 09 September 2017 before staging such a 3rd class drama. Here another aspect is worth mentioning. On 20 February 2019, a report about increasing suicides in Indian army, Air Force and Navy was presented in the Indian Parliament which has details of suicides from 2011 to 2018 in the Indian forces. The majority of suicides were from the Central Armed Police Force (CAPF) deployed in IOK and Assam Rifles deployed in Indian Occupied state of Assam. Now is this merely a coincidence that the convoy that was targeted in Pulwama was also from CAPF soldiers and except one of them all others were from Dalit class. This should be kept in mind that Assam is also fiercely fighting for freedom from India. The report also has the details of such suicide incidents in which suicider before killing himself shot down his commanders. Although, this report is much lengthy but one of its main points is that Indian soldiers have been found involved in selling the automatic weapons to the Kashmiri Mujahideen. 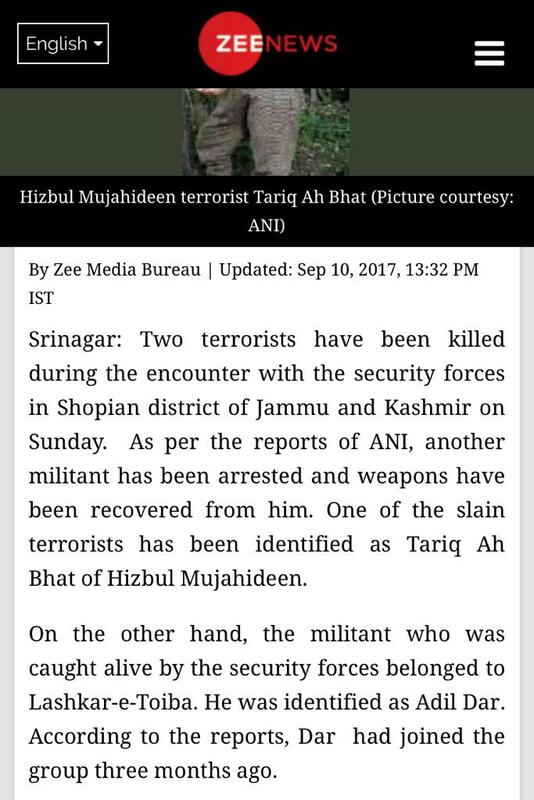 According to the reports there are such soldiers who absconded from Indian army and joined Kashmiri Mujahideen to fight against Indian army. Why were they forced for treason against Indian army? This has been answered as well in the report. 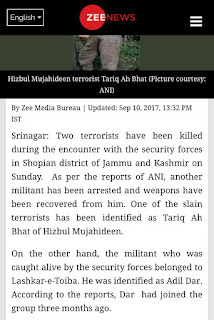 According to the report, out of various arrested Mujahideen two were Indian army’s absconders who left Indian army as they were forced to attack unarmed Kashmiris against the values of professional army. They were told that they have to control few insurgents who enter IOK from pakistan, and take out militant activities. Otherwise people of Kashmir love India. The ground reality is that from children to elderly every Kashmiri hates India. The hatred of Kashmiris is due to the unending war of Hindu soldiers. 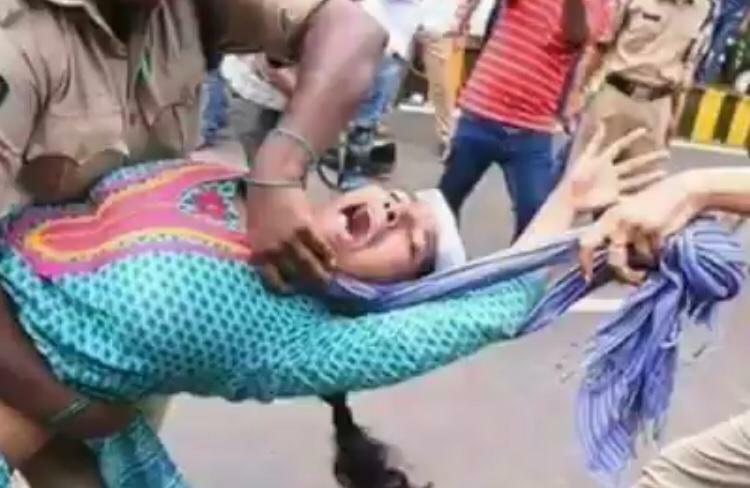 Indian soldiers are suffering with mental diseases, suicide and absconding from Indian army as they are forced to torture Kashmiris and kill them in cold blood; Majority of the Indian soldiers are ashamed over such inhuman acts. According to a retired Commander of Indian Navy, after attack over Indian Parliament need was felt for Intelligence of Indian Navy in order to save the coastline from the attacks of Pakistani terrorists for which 9 officers of Indian Navy volunteered themselves. 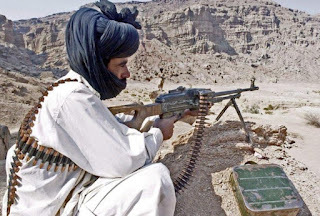 According to him, RAW has informed Indian Navy that Lashkar-e-Tayba (LeT) is training such militants in the training camps at Azad Kashmir who can participate in naval wars. The intelligence of the Indian Navy included Kulbhushan Yadav as well. Although, while talking about the marine skills of Pakistani terrorists being trained at Azad Kashmir forgot that neither there is any sea nor coastline at Azad Kashmir. 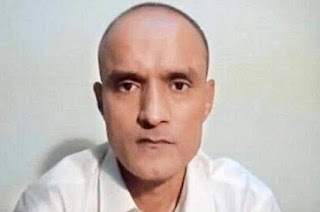 However, according to him when Kulbhushan was deployed at Chah Bahar coast of Iran in 2003, Kulbhushan wished to remain part of Indian Navy despite working for RAW. He wanted to remain part of Indian Navy from promotion to retirement. He told that Kulbhushan was given documents with the name of Hussein Mubarak Patel in 2003 for deployment in Iran. According to these documents Hussein Mubarak was resident of Puna. His Passport No. was E6934766, his residential address was of Martand Cooperative Housing Society of Pune. 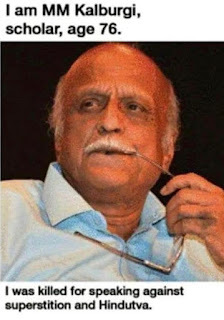 However, according to the research of Indian journalist Praveen Swami the same passport was issued and used by another Indian citizen with a different name. The whole record of this citizen was deleted from the passport office of Pune, meaning India RAW has such passports and other travel documents. According to Indian the money for travel to Chah Bahar, Iran was provided by the Indian Navy to set up business. Kulbhushan Yadav laid the foundation of the Kaminda Trading Company, starting repairing of Marine Engines. Afterward, the said company started importing Gypsum from India to fulfill the demand of cement factories in Iran. However, the financial record of the so-called company could not be disclosed so far. Kulbhushan was arrested in Tehsil Mushkel of Balochistan on 03 March 2016, when he arrived there to meet the local terrorist of Balochistan Liberation Army (BLA) from Chah Bahar. 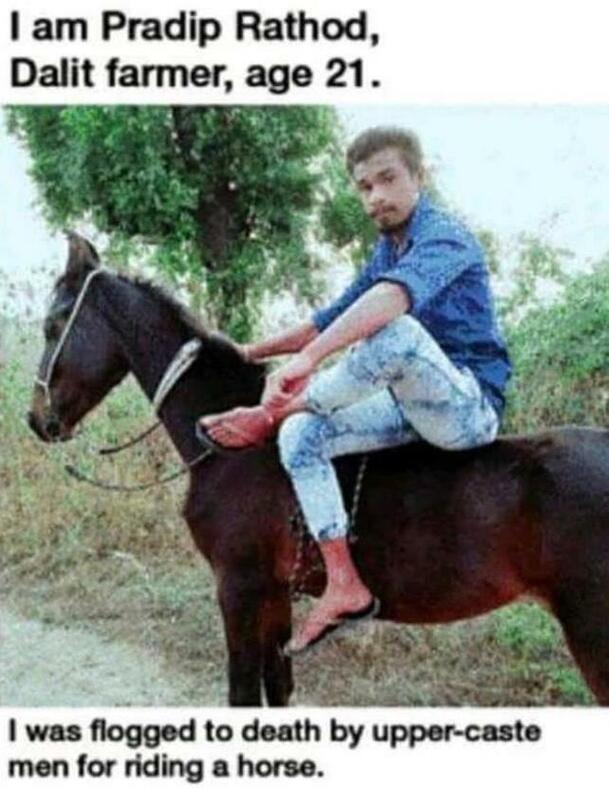 He selected one of the secret ways used by smugglers and terrorist to travel to the Mushkel situated at the border of Iran-Pakistan. His arrest was a serious blow for India. Kulbhushan told Pakistani security agencies that since 2003, he visited Pakistan many times. He told that he was deployed to exploit BLA terrorists for bomb blasts, terrorism, attacks over Pakistan army convoys and military installations. 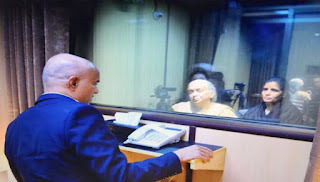 Kulbhushan Yadav in his confessional video confessed that he was deployed for separation of Balochistan through terrorism, target killing in Karachi, infiltration of terrorists through the coastline of Karachi. The confessional statement of Kulbhushan is the evidence that India uses his officials against her neighbors since long. Indian is the murderer of the thousands of the Pakistanis. Look at the shamelessness of India that despite being involved in the terrorism in Pakistan, India adopted the anti-Pakistan statement and gave the same to the Bangladesh and Afghan governments that Pakistan is supervising the terrorism, Pakistan trains terrorists and uses them as a strategy against other countries. India acknowledged Kulbushan as a spy but did not tell why he was deployed in Iran with a fake ID. India is stubborn that Kulbhushan got early retirement and started the business in Iran which has nothing to do with the Indian govt. 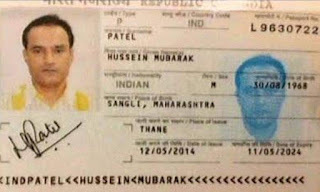 However, India did not tell why he used fake name and ID of Hussein Mubarak Patel for business at Chah Bahar Iran. In fact, India has been trapped by acknowledging Kulbhushan as Indian citizen with the name of Kulbhushan Yadav. He wants to save his life. 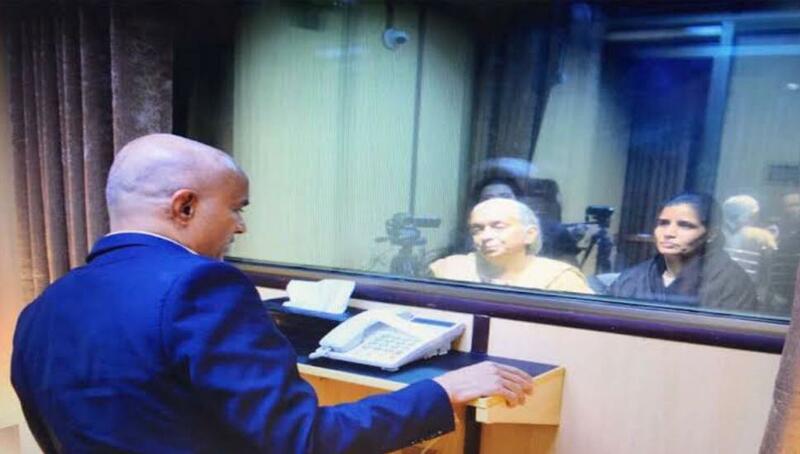 India contacted International Court to suspend the punishment, trap Pakistan into the lollypop of peace negotiations, and make deal with Pakistan on some other matter getting Kulbhushan freed. Pakistan has no shortage of such traitors who have been departing Indian terrorists like Kashmir Singh, Surjeet Singh, Ram Raj, Ram Prakash, Suram Singh, and others given punishment in Pakistan with flowers on the Indian border. The efforts for freedom of Surabjeet Singh were on the full swing when he was killed in a fight between the prisoners. Traitors in Pakistan raised the hue and cry over it while he has been sentenced to death by Pakistani courts for terrorism in Pakistan. The Hearing of Kulbhushan is going to be held at International Court on 18 February 2019. Om 19 February 2019, Pakistan’s lawyer Khawar Qureshi will handover confessional statement of Kulbhushan, Indian terrorism in Pakistan confessed by Kulbhushan. When on duty terrorist and agent of Indian RAW Kulbhushan has confessed his crimes, International Court has limited powers to give relief to Kulbhushan according to Indian wishes in such condition. In the way India exploited American war on terror in Afghanistan against Pakistan for terrorism from Peshawar to Karachi, Indian officers of RAW and Intelligence Bureau were involved in this state terrorism of India. More than 80,000 innocent Pakistanis lost their lives in this Indian terrorism from parks, schools, hospitals, educational institutions, markets, religious places etc. All this terrorism was done in Pakistan because Hindu extremists are not ready to accept the freedom of Pakistan from Akhand Baharat. Since the last 71 years, Hindu Indians are unable to realize Pakistan as a free country and reality. 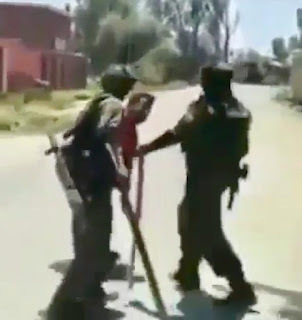 Three Indian soldiers carrying rifles on their shoulders and batons in their hands stop a Kashmiri youngster riding a bike in the mid of a crossover in the name of checking. They start beating the youngster with batons asking him to chant slogans in the favor of India. 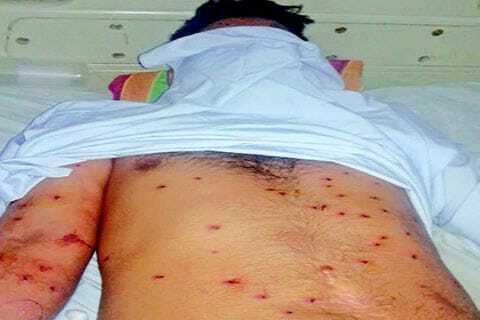 Kashmiri youngster while trying to stop the batons with his hands chants the slogans of India. Another Indian soldier (feeling ashamed of writing him a SOLDIER) demands the slogans against Pakistan. In the meanwhile, all three Indian soldiers start beating him with batons and abuse him. The Kashmiri youngster being beaten is repeating slogans against Pakistan and begging to stop beating him but neither they stop beating him nor abusing him. In the meanwhile another Indian soldiers arrive and start recording the whole scene in his mobile phone, asking the other three soldiers to check the cellphone of the Kashmiri youngster and take him inside. Kashmiri youngster at once hands over his cellphone to the Indian soldiers and they start checking Gallery of his cell phone. 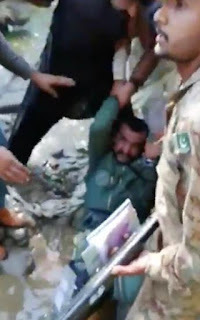 They find the picture of Elderly Kashmiri Leader Ali Gillani, Indian soldiers once again start beating him that why has he kept his father’s picture in the mobile. Kashmiri youngster while crying begs that he kept these pictures mistakenly and will not do that again. One of the Indian soldier asks others him to take inside and start dragging him, and the camera is closed. 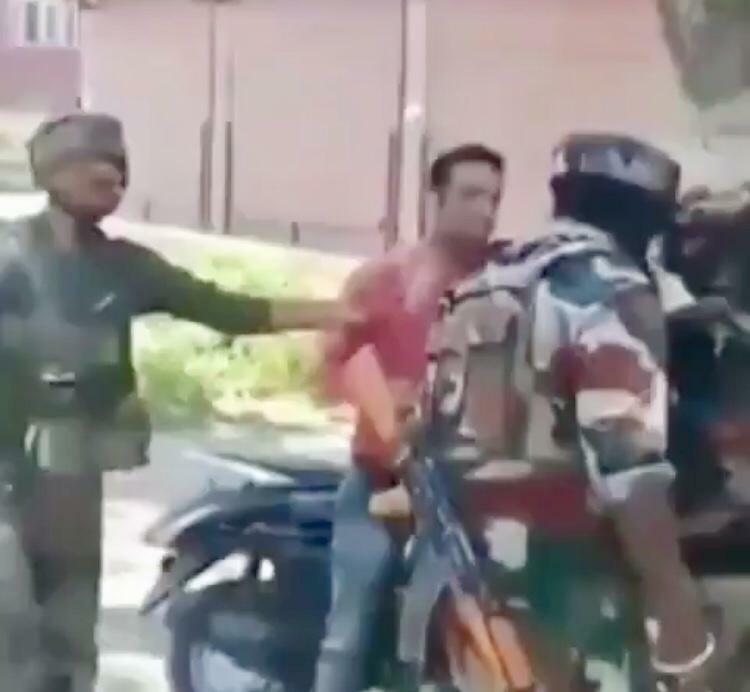 This is the clip made by the Indian soldiers, which he shared with his friends and family to show off his bravery against unarmed and powerless Kashmiris. 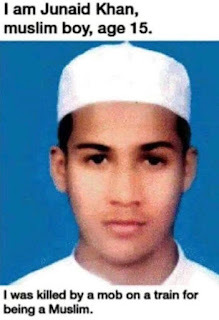 What happened to the youngster whether he was taken into custody or killed him in a fake encounter? 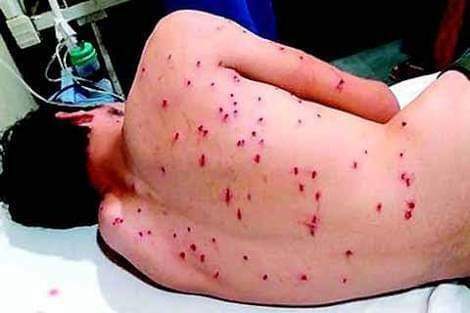 Astonishingly, the number one army after Chinese army out of the 29 world military powers equipped with the latest weapons feels proud in torturing the unarmed people to chant slogans against the neighboring country, claims firing over stone pelting children as professionalism insulting the profession of army and SOLDIER. 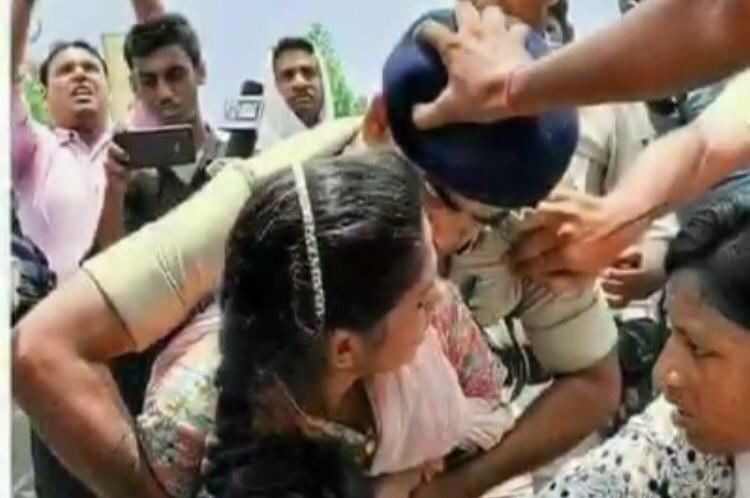 The gang rapes of Kashmiri women are adopted as a war strategy, not only this they tie up the Kashmiri youngsters on their jeeps as human shields to save themselves from the stones thrown by the protesting Kashmiris and are praised by their commanders with medals. American and NATO forces used all types of lethal and destructive weapons against Afghan resisting forces after attack over Afghanistan in 2001. They used daisy cutter bombs, missiles. However, neither they used the Afghans as human shields nor gang raped Afghani women as a war strategy to discourage the resisting Afghans. After using all the strategies of war, at least americans understood that they cannot defeat the Afghan Taliban fighting for their identity and freedom. As long as they realized this they decided to withdraw from Afghanistan's decided this in 17 bloody years. But Indian rulers and Army Commanders are unable to understand in the 71 years that Kashmiris are not ready to live with India and accept the capture of Kashmir by Indian soldiers. They want to expel Indian soldiers at all costs. 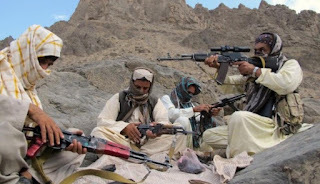 Afghan Taliban are fighting armed with weapons against the foreign forces, just like the Indian Held Kashmir, Americans also established a puppet government in Kabul which needed American umbrella despite supervision of Americans. Indian failed in the drama of puppet govt. and enforced Presidential system but still, India claims to be Champion of Democracy and Secularism. Indian rulers signed the written deal of giving right of self determination to the Kashmiris in 1948 in the UNO. since than they are denying this promise. In the last 7 decades, they have converted Indian Held Kashmir practically into military cantonments. In these 71 years, Indians have committed all such atrocities against Kashmiris which have ashamed the whole humanity. However, Indian soldiers claim Kashmir being the ATOOT ANG of india and massacring Kashmiris for their nefarious designs. According to the facts and figures, there is one indian soldier for every 12 Kashmiris in Indian Held Kashmir. Such strength is not even deployed in the prisons over prisoners. 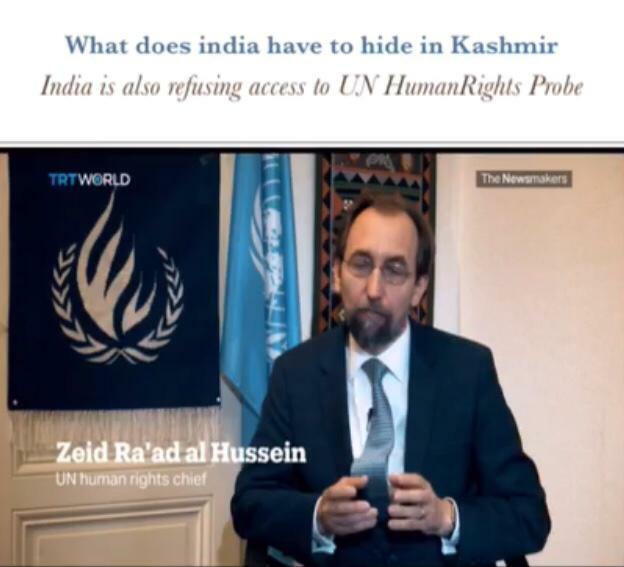 Due to the interests of World Powers linked with the markets of India, they are not ready to spell a single world over the violations of human rights by Indians. Even the country like the USA, issues the reports of the violations of human rights by Indians when sales of American weapons drops. Apparently, India rejects these reports. However, after the passage of sometime, we get the news of billion dollar deals between Indian rulers and American Weapon Manufacturers. In order to prolong her hold over the Indian Held Kashmir, Indian rulers have purchased latest fighter jets, ships, submarines, Tanks, anti-tank and anti aircraft missile systems converting India practically into a godown of weapons. However, neither Indians are ready to give right of self determination to Kashmiris nor basic facilities to its public. India is the only country, whose people are forced to buy rats sold in the markets. Indian Army Chief supports indiscriminate firing over stone pelting children because his soldiers may lose their life due to being hit by the stones. Torture, violence, inhuman acts have been made the part of the Indian army. Indian army has made life hardest in the IHK. Every year, Pakistan celebrates 5 February as the Day of Solidarity with Kashmiris. This has now spread all over the world. In all the countries wherever Pakistanis live, rallies are held on 5 February in favor of Kashmiris. From last few years, locals and non-Pakistanis have also started participation in these rallies that India should give the right of self determination to Kashmiris or declare India as the enemy of democracy and humanity. Every day Indian forces kill innocent Kashmiris, takes them into custody without registering any case. Even Indian journalists have started raising voice against the Indian army and Police of the puppet state of IHK. Indian Generals and politicians should realize that on the gun point they may force Kashmiris to chant slogans against Pakistan but not a single Kashmiri wants to live under the control of Indians.